Visiting your loved one in their new elderly home can be a strange experience at first, particularly if they have a condition like Alzheimer’s where they were unable to fully understand the transition. Leaving their home to come to a dementia home in Cambridgeshire is often a real upheaval. Here are ten things that you could bring with you to our residential care home in Cambridgeshire to help a confused love one to feel better. We are very happy for people to decorate residents’ bedrooms as far as space allows, including bringing furniture and paintings from home. Just ask if you need our handyman to put anything up for you. We hold a broad range of activities that the residents are welcome to join in with if they wish, but if your loved one can only remember how to play one game then bring that along and they will be delighted. We all have that one film that we can recite the dialogue for. For a person with dementia, being able to watch a familiar film may be a very enjoyable experience. Sometimes the scenes will spark memories they can talk about, and sometimes they might just want to cuddle up and watch in silence. Your loved one might take great satisfaction from looking through old photos and pointing out the people and events that they recognise. Even if they can’t recognise anything, they might like to examine the outfits or objects in the photos. This is one of the most powerful memory joggers, alongside scent, so please do bring their favourite songs for them to listen to. You could be surprised by them waltzing you around the bedroom! We provide fresh food and snacks, cooked on-site, and cater for a wide range of tastes. It can be a lovely experience seeing your loved one’s eyes light up at the sight of “naughty” food. While too many people at once can be overwhelming, it is a good idea to bring along other family members. You can set up music while they are talking to the resident, for example, and take turns bonding. 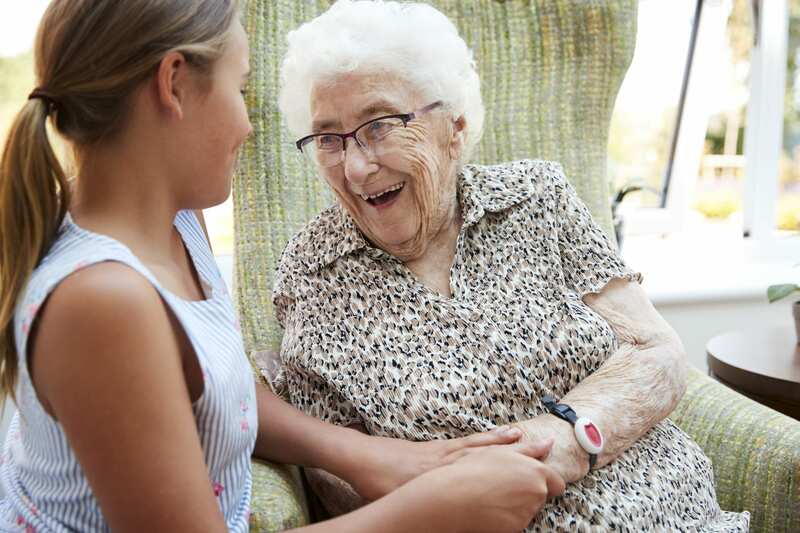 As anyone who has watched Channel 4’s documentary on the subject knows, elderly people often respond very well to the presence of young children! In July 2018, local mothers brought their children to see our residents and it was a great success. Of course, you’ll bring yourself! But do so mentally as well as physically. Really stay present in the moment with your loved one. Don’t think about what they used to be like; don’t say “Do you remember this?” Go at their pace, in their world, and try not to get upset if they don’t always know exactly who you are.